﻿ Are Colbert’s New Politics Softer, or Just More Subtle? So, given these limitations, how did Stephen Colbert as political critic fare this past week? As expected, the first week of the show revealed a more politically restrained Colbert, and even some clichéd bipartisan statements and gestures. But given the new context, he managed to keep the show’s politics fairly pointed. And maybe, just maybe, his more bipartisan tone will prove to be a strategic way for him to deliver his more politically daring messages. A girl can dream. Already, the focus and overall content of Colbert’s Late Show has been far more political than that of other late night network talk shows, including David Letterman’s. Colbert’s guests for the first week included Jeb Bush and Joe Biden, and the guests for the second week include Supreme Court Justice Stephen Breyer, United Nations Secretary-General Ban Ki Moon, and Vermont Senator Bernie Sanders. While David Letterman did interview then–Vice President Al Gore during his second week hosting The Late Show in 1993, none of his other early guests were involved in politics. When Jay Leno took over The Tonight Show in 1992, his early guests were Billy Crystal, Emilio Estevez, and Christian Slater. When Jimmy Fallon replaced Leno in 2014, he had Michelle Obama on, and even asked her about the Affordable Care Act, but the rest of the interview steered clear of politics, while Fallon’s other first week guests—Will Smith, Jerry Seinfeld, Bradley Cooper, and Justin Timberlake—all fit the mold left by his predecessor. But hosting politicians, judges and diplomats doesn’t make the show politically pointed, per se. For that we have to look at the interviews themselves, and the monologues. 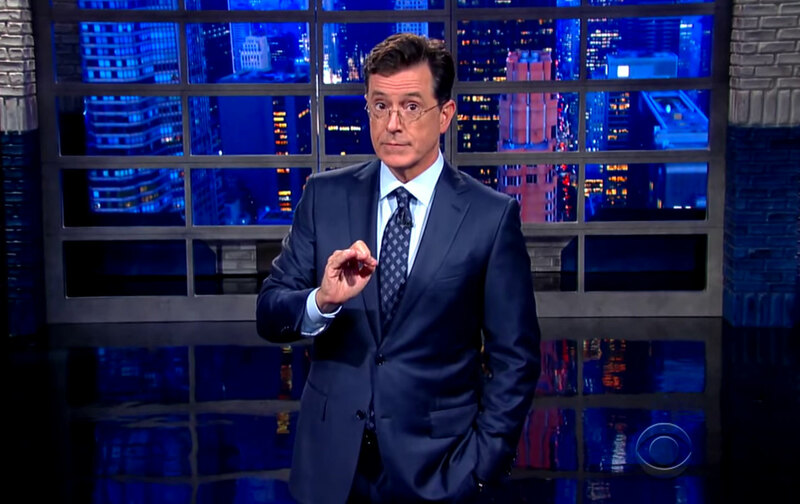 But Colbert’s comedic voice and political perspective were more present in a segment when he went after the media, himself included, for its unhealthy addiction to Trump coverage: “Just like the rest of the media, I will be covering all the presidential candidates—who are Donald Trump.” Colbert then showed a clip of Trump criticizing Nabisco for shutting down an Oreo plant in Chicago and moving it to Mexico, forcing The Donald to vow, “I’ll never eat ’em again.” Colbert reflected, “I’m not surprised that Donald Trump is willing to stand up to Big Cookie. After all, he’s the only candidate brave enough to deport the Keebler Elves.” And then, in a Trumpish voice, said to an image of Keebler Elves, “Hey tree freaks, keep your filthy fudgy fingers off our jobs.” Colbert then tried, unsuccessfully, to resist the temptation to eat Oreos from a bag that appeared and, also unsuccessfully, to resist the temptation to watch more clips of Trump looking and sounding like an idiot. During his first interview on The Late Show, Colbert certainly didn’t skewer Jeb Bush the way he could have and maybe would have on The Colbert Report. As Emily Nussbaum writes, “Mostly, Bush got to spout off talking points, branding himself as a benign presence, who was, unlike Trump, a small-government conservative interested in ‘fiscal restraint.’ The two men joked about logos. It was aggressively collegial, a kick in the shins to anyone who worried that Colbert would be some liberal muckraker.” And Colbert has been criticized for being too soft during his interview with Travis Kalanick, CEO of the ethically challenged, free-market fundamentalist Uber corporation. Yet Colbert managed to pack some punches in these interviews. He challenged some of Uber’s practices, saying, “You talk about how good this is for drivers. But you said you want self-driving Uber cars… That’s not for the driver. You’re employing robots at that point.” He also criticized Uber’s surge pricing for raising fare rates as much as four times the norm during last year’s hostage crisis in Sydney’s central banking district. “Is that how we should be treating each other?” he asked. Instead of having the men removed, Stephen acted with complete respect and control. He listened intently to what they had to say. When the guy finished, Stephen said that he was planning on asking a similar question, and politely asked the man to be seated. He then turned back to the interview and addressed exactly what the man had yelled about. It was very smooth.… Then five minutes later, another man got up and yelled something else. The Uber guy started to talk back to him, but Stephen calmly touched his arm and quieted both him and the cab driver in the balcony. He said that he would ask the man’s question “in a more respectful way.” Then he again respectfully asked the man to sit down, and he asked exactly what the man had yelled about. At first I was outraged. How could Colbert say that? What “fair and balanced” BS! He can’t honestly believe there are any good people on the Republican side. But… maybe he does believe they are good people, even if they are not good candidates. Or maybe after having talked about loss and tragedy, he thought it unseemly to be anything but gentle. Or maybe he really is trying to come off as center of the road. But if any of these things are true and they allow him to engage politically, to encourage candidates to enter a race, maybe that is the subversive strategy I was dreaming of. Previous ﻿ Trevor Noah Says He’s Not a Political Progressive. He’d Be Funnier If He Were.